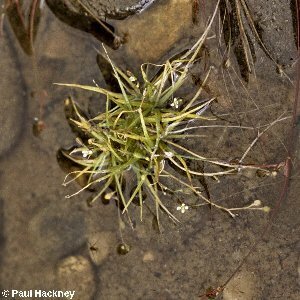 A small submerged aquatic plant with small white 4-petalled flowers and narrow grass-like leaves, found in similar situations to water lobelia (Lobelia dortmanna) and shoreweed (Littorella uniflora). First found by Sherard in the 1690s in Lough Neagh at its south-east corner, and re-found in 1744 in the same area. Subsequently found at other sites in the south-east of Lough Neagh and at Creagh Bog to the north-east of Lough Neagh, and in Lough Beg in 1870. Other nineteenth century records come from the canal at Newry and in the River Bann at Coleraine. After 1870 the plant was lost sight of until rediscovered by Miss M.P.H. Kertland in 1955-6 along Lough Beg's eastern shore. It has not been seen since. Its decline may have been caused by eutrophication of Lough Neagh and Lough Beg. 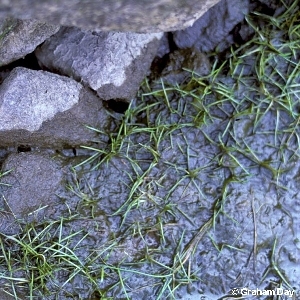 The photograph is of a Scottish plant. All names: Subularia aquatica L.